I grew up in an era that was regaled with the machismo action productions of the likes of Stallone, Schwarzenegger, Willis, Van-Damme, Snipes, and Reeves….wait, what?! Point Break, Speed, Johnny Mnemonic all have varying levels competent film-making (the latter has the least) but they were all works of action film-making starring the original “Ted”, Keanu Reeves. The argument could be made that he represents the passive action hero who is not the muscle-bulging, one-liner spouting, running-from-an-explosion-while-screaming action hero that we grew accustomed to in the 80’s and 90’s. Keanu generally plays the hero who gets dragged along by more assertive and intelligent character(s) (The Matrix, Speed, Point Break) and therefore was rarely viewed as an action star. He plays the dumbfounded-yet-surprisingly-capable guy with a certain aplomb and that look on his face has served him well. He was a symbol of the newer age action hero, getting involved with extreme sports and computer hackers while still wielding his 9mm. Check out that superb lighting. And now, he’s gone old school. 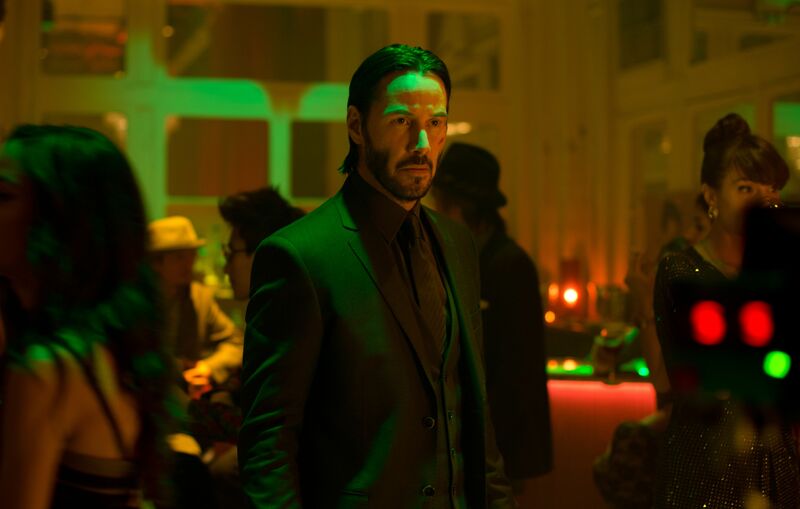 While not throwback to the muscle-bound action films of yore, John Wick is a blending of old and new action. You can blame the Taken series for the birth of the “man-with-a-certain-set-of-skills” movie craze that we’re being subjected to on a monthly basis now. But where that series falls short with its attempts at poor storytelling and terrible monologues that have become Liam Neeson staples, John Wick side-steps this and succeeds at being what it knows it is: slick and straightforward action. Keanu is cast perfectly in the title role of a man with a certain set of skills who seeks revenge for a wrong done to him. The reason for the revenge plot is unimportant, as they never matter in these movies, but animal lovers may sympathize with our hero more than usual. This movie has all the old school elements: a retired assassin, Russian villains, gun-play, hand-to-hand combat, the hero-gets-caught-and-needs-help-to-get-out trope, and eventually a final stand-off. Check all the boxes off. I think what’s most enjoyable about this movie is it’s insistence on being simple. A man gets wronged and he seeks revenge for that. Aside from a few monologues about who John Wick is and why it was a bad idea to upset him, we are not treated to stupid dialogue and over-bloated narrative nonsense about the evil-doings of the bad guys and how they want to take over the world and blah blah blah. Enjoy the ride. P.S. It’s worth noting the color palette and lighting in this movie is fantastic, just look at that image above. The mood is appropriately dark and the additional colors only add to the coolness of the action. Previous Oh, Glory Days: More Trailers!